This spacious two bedroom apartment is situated on an exceptionally well maintained development in Lower Peyia. Located on the top floor, the property benefits from amazing sea views and beautiful sunsets. 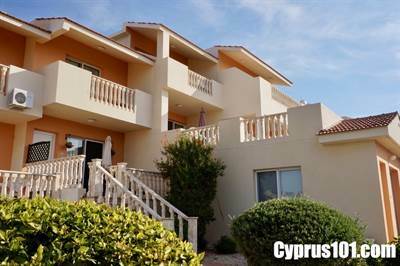 Peyia has a wide range of amenities and the popular holiday resort of Coral Bay is only a few minutes’ drive away. The accommodation features an open plan living room with cosy lounge, formal dining area and well equipped kitchen with breakfast bar. Built in cupboards in the entrance hallway provide useful storage space. With two sets of sliding patio windows, the living room is flooded with light and there is easy direct access to a good size covered veranda overlooking the colourful communal gardens and fabulous sea views beyond. The kitchen located to the rear of the dining area is modern with plenty of work surfaces and fitted units. Appliances include a built-in oven, ceramic hob & extractor fan, microwave, fridge/freezer and washing machine. Through a decorative archway is a hallway leading to two double bedrooms with fitted wardrobes, freshly decorated in neutral tones. A separate family size bathroom features a bath and overhead shower. Tastefully furnished and ready to move in, this property is an ideal holiday home and/or rental investment and has full title deeds.